FLOUR is basically a powdery substance made up of grains such as wheat, corn, or rice. Most flour that we use on a daily basis consists of wheat. Wheat has gluten that helps give strength and elasticity to baked goods such as bread, pastries, and cakes. However, there are many types of flour in the market today. There are all-purpose flour, self-raising flour, bread flour, biscuit flour and high-ratio flour. How can we possibly tell them apart? Well, flours are classified based on their protein content. The protein content in flour plays a very important role when it comes to baking. The higher the protein content, the tougher and more elastic the dough will turn out to be. Flours like all-purpose and bread flours have a higher protein content compared to biscuit and high-ratio flours. Many people think that flour has a high shelf-life and can be kept for months. Well, that’s not the case. Flour can only be kept for up to two months. If it is kept any longer, it will start to smell odd and will affect the taste of your baked goods. Nonetheless, if you want to store it a little longer than two months, store it in the fridge. This is the must-have flour in every household. It is the most common flour found in hypermarkets and also relatively cheaper compared to other types of flour. All-purpose flour is also known as plain flour and general purpose wheat flour. So, is all-purpose flour really “all-purpose”? The answer is yes. You can bake all types of baked goods with this flour, all except bread. All-purpose flour has a high-ratio of protein content, from 9.5% – 10.5% but not high enough to make bread. Self-raising flour is basically plain flour with 4% baking soda and salt. You should only use them when required by the recipe. This flour helps baked goods like muffins and cakes to rise when baking (because of the baking soda). It makes them soft and light. If you do not have self-raising flour at home, you can use plain flour and just add in baking soda and salt. So, if your recipe calls for two cups of self-raising flour, you’ll measure out two cups of all-purpose flour, and add two and a half teaspoon baking powder and half teaspoon salt. Bread flour is one of the highest protein flour, from 12.6% – 13.6%. It will give you the best result when making bread compared to other types of flour. Bread flour contains more gluten. This will result in a more elastic dough, creating lighter and chewier bread. Some manufacturers these days add a little chlorination in their bread flour so that the bread will look more appealing and white. However, this flour can be tough to find in hypermarkets. You buy them at the baking supply stores. Biscuit flour has a relatively low protein content, from 8.5% – 9.5 %. It contains less gluten that makes it ideal for baking variety of cookies and biscuits. Using this flour will result in tender and crumblier cookies and biscuits. If you do not have biscuit flour at home, you can substitute it with eight parts all-purpose flour and two parts corn starch. This flour can also be tough to find in hypermarkets so, you would have to go to a baking supply store to buy them. 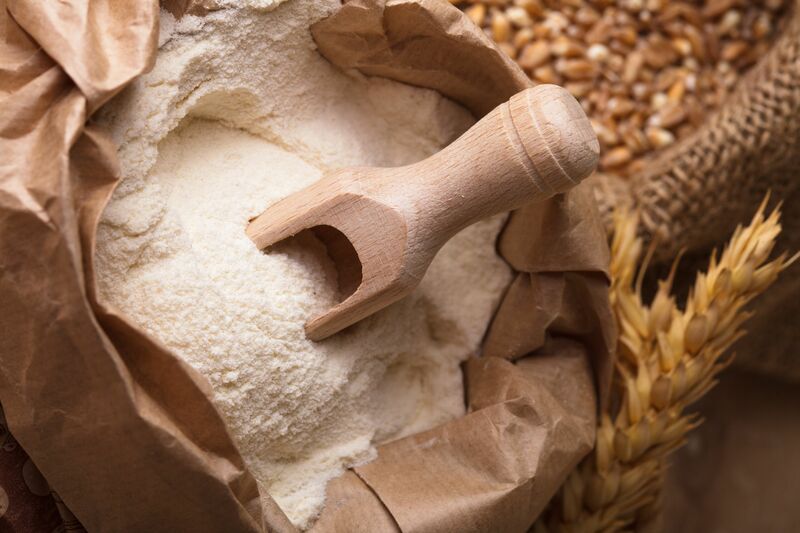 High-ratio flour has the lowest protein content among all the other flours, from 7.5% – 8.5%. It has a very fine texture and is extremely white. This flour is also known as chlorinated flour which explains its extremely white appearance. Although the sound of it being “chlorinated” can come off as unhealthy, the chlorination is only minimal. The chlorination allows the flour to hold more sugar and water when baking that makes the cakes super moist and airy. This flour is ideally suited for sponge and chiffon cakes. So when choosing flour, it is important to look at their protein content on the label. You can easily distinguish what type of flour it is and which is most suitable for baking. Now that you know how to choose the right flour, why not attend one of our baking workshops. For details, www.kuali.com/bakewithkuali/. What is the combination of gluten free flour?